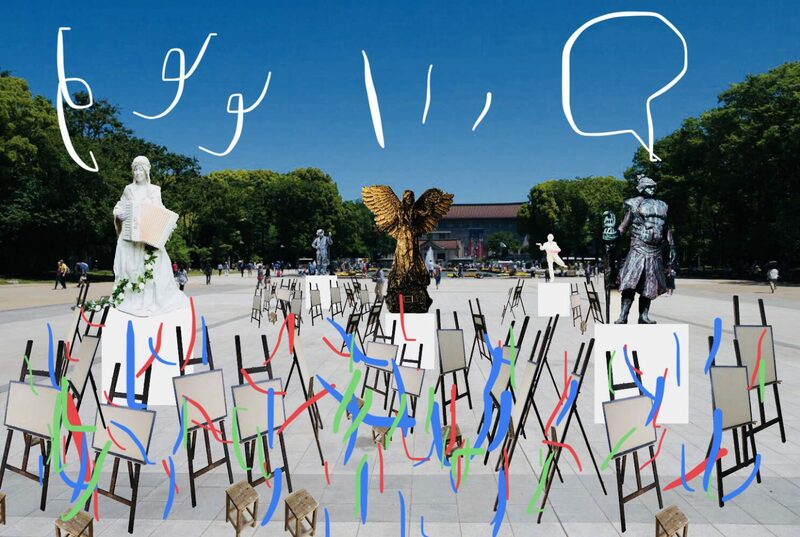 We will hold a sketching event for drawing street performers (“statues”) dressed as outdoor sculptures. Fountain Square, located in the center of the park among the museums, will become everyone’s atelier for three days. Visitors share cultural time with diverse people while watching paintings in progress in an atmosphere like that of an open studio, participating in sketches, and receiving advice from students and alumni of Tokyo University of the Arts who will be the lecturers. UENOYES General Producer Katsuhiko HIBINO will pick up several of the paintings drawn here by children and display them at The University Art Museum, Tokyo University of the Arts in October. Target: it is open to anyone (from children to adults). Experience does not matter. If you have the material you want to use, bring your own. Drawing paper, crayons, easels, picture boards and chairs will be lent free. *Please note that the event may be relocated or canceled in case of rainy or stormy weather.